I have to confess that before I actually owned one of these little red marvels I was totally under the impression that it was a glorified toy; how wrong I was. Edmund Scientific's Astroscan has been around almost unchanged for over 30 years — and that's no small achievement. In fact, it won the Industrial Design Award in 1976. Much like the Questar, Edmund got the Astroscan right almost from the start, so no major changes have been necessary in its long and illustrious career. It's been around almost exactly as long as I've been into astronomy, so magazine adverts for the Astroscan have long made their subliminal impact on me. The 'scope is a 105mm aperture f/4.24 (445mm focal length) Newtonian with the secondary mirror mount attached to centre of a coated optical window, so there's no annoying diffraction spikes around bright stars. (And you all know by now how much I dislike diffraction spikes, right?) Furthermore, there are no collimation adjustments since it's set at the factory. Add the fact that the body of the Astroscan is made of ABS plastic, then you have a pretty indestructible 'scope — hence its suitability for kids. When my daughter Abby, five years old at the time, first saw it she was transfixed. No other 'scope that's passed through my hands has had quite the same effect on her. 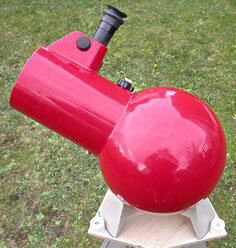 Of course, much of it is down to the bright red colour and its shape, but the elegant simplicity of the Astroscan's ball altazimuth mount certainly appealed to her enough that she wanted to go outside and look at the Moon through it. And that's what it's all about, isn't it? So how does it perform? You will read various accounts of the Astroscan's variable optical quality, but I have to say that my twenty-year-old, Japanese-made model is pretty darn good — a well-figured paraboloid and nearly perfectly collimated after all these years. With a 4mm William Optics UWAN eyepiece I can get a 0.7° field of good definition at 110x, but this isn't where the 'scope excels. 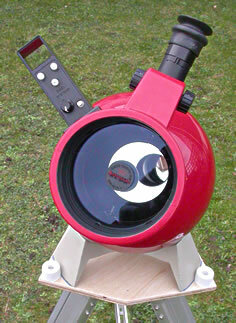 With the supplied Edmund 28mm RKE eyepiece I can get a 3° field at 16x, making it a tremendous rich-field instrument. Even with such a wide, low-power field some sort of finder is desirable. Edmund's own 'peep sight' is adequate, but to my mind you can't beat a Rigel Systems Quikfinder reflex sight that complements the Astroscan perfectly. One extra thing that you will need is some sort of tripod. Edmund sell their own that accommodates the table-top base, but I made my own adaptor plate for a spare Vixen full height tripod from a piece of ½-inch ply. Now I can (and frequently do) take my Astroscan anywhere.